Ocean Inn is a North Myrtle Beach resort in the Crescent Beach section of North Myrtle Beach, South Carolina. Located between 13th and 14th Avenues South, this oceanfront in is a delightful retreat for a North Myrtle Beach vacation for a family or a romantic getaway for an anniversary celebration. Ocean Inn has only four levels of North Myrtle Beach condominiums and only five units are on every floor. This makes for a more intimate North Myrtle Beach vacation experience that is full of peace and tranquility on the oceanfront. This North Myrtle Beach resort features a sparkling blue swimming pool that is centrally located. 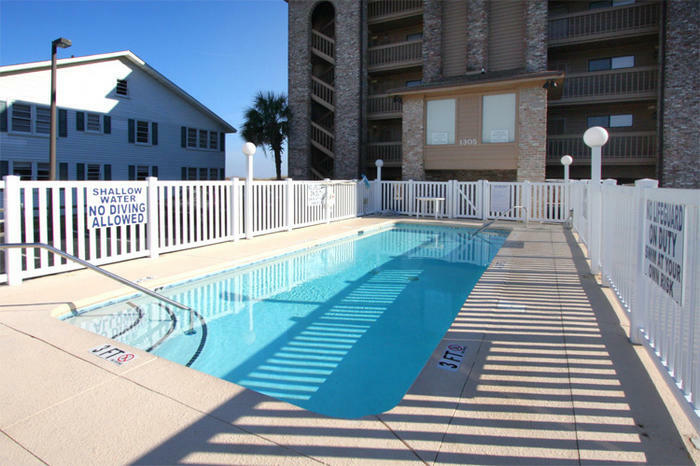 It is near the elevator so you can quickly get from your comfortable North Myrtle Beach vacation rental to the swimming pool deck. During a North Myrtle Beach vacation you want to spend as little time as possible getting from one destination to another because there is so much to do in town. Time is of the essence. Ocean Inn features covered parking on the ground level of this North Myrtle Beach resort as it is built on stilts and covered parking is between the piers. Go for a swim when the sun gets high in the North Myrtle Beach sky. What a refreshing way to cool off and enjoy the afternoon. The sparkling blue swimming pool and the sun deck face Ocean Boulevard. On the other side of this North Myrtle Beach resort is the fantastic Atlantic Ocean and the white sandy beaches. The only thing between you and the beachfront is a beautiful dune line that is filled with sea oats. A sandy path leads you from Ocean Inn to the beach so you can look for seashells, swim in the Atlantic Ocean and relax with a good book during your North Myrtle Beach vacation. There are one-bedroom North Myrtle Beach vacation rentals at Ocean Inn. These nicely furnished North Myrtle Beach condominiums have sleeping accommodations for six people. There are two beds in the private bedroom of these North Myrtle Beach rentals and then a sleeper sofa in the living room sleeps two more people. Ocean Inn features North Myrtle Beach condo rentals that have a well equipped kitchen. From the breakfast bar that is ideal for serving cereal to the kids or snacks in the afternoon to the dishwasher that makes for easy clean up, these kitchens are terrific. How nice to have such amenities at your fingertips during a North Myrtle Beach vacation. Elliott Beach Rentals is not affiliated with onsite management or the HOA of Ocean Inn.